Mother's day is just round the corner. 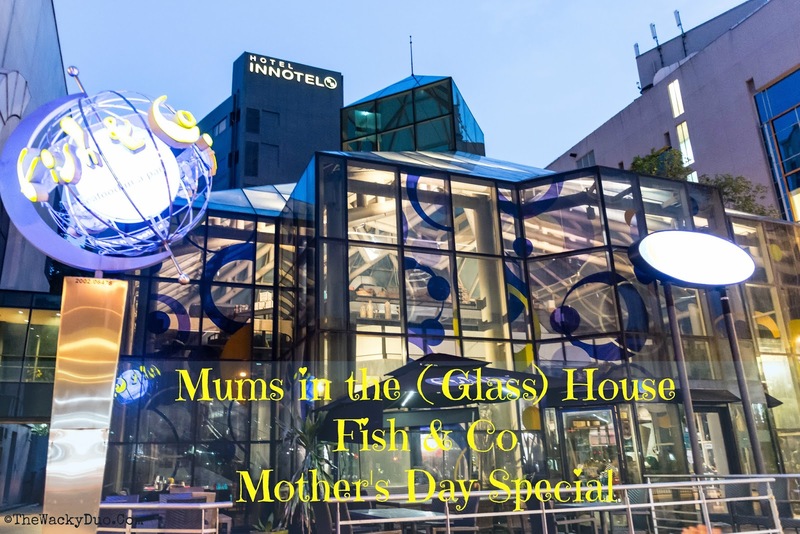 The boys decided to bring Mommy out for dinner at Fish & Co iconic Glass House@ Park Mall for a special Mother's day special feast. The venue was selected because we heard that it will probably be the last time we can celebrate Mother's day there as it was slanted for closure this coming June. We had the Mother's Day Deluxe Platter. When it arrived, we were a tad 'shock' by the generous portion. It was a huge platter filled with seafood in chilli cream mushroom sauce, alongside with beef bacon, chicken chorizo and assorted vegetables! The Mother's day deluxe platter can be ordered from Fish & Co from 27 April to 8 May at all outlets except Vivo City, Waterway Point and East Coast . So make your bookings early to avoid disappointment. You are probably wondering... does it taste as good as it looks? Let's say if you are a fan of seafood, you would be left beaming from cheek to cheek (like us!). The seafood was fresh and a delight to savour. The mixture of the ingredients left a luxurious experience on our tastebuds. If you want to give your seafood loving mom a treat, this will be it! 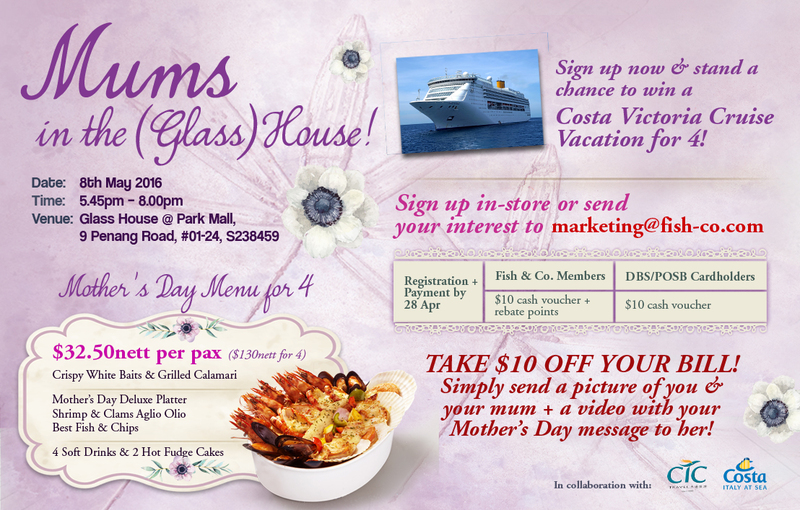 You can sign up in store or email to marketing@fish-co.com for reservations. Sign up now and stand a chance to win a Costa Victoria Cruise vacation for 4! As mentioned earlier, Fish & Co will be leaving the iconic Glass House after June. After almost 14 years there, it will be sad to see it go due to a change in management. Many couples had probably had their first date there, thus making it is a nostalgic if not iconic location. There are still no plans (yet) to turn this place into another restaurant, so do not miss the opportunity to dine there while you still can. Since we were there, we thought it will be great to archive a little bit of history on the blog. There is an ongoing promotion till the end of June. Dine in the Glass House during your birthday or with a group of 10 pax and enjoy 20% off your bill. Time to say Bon Voyage to Fish & Co @ Glass House! The Wacky Duo were treated to a Mother's Day Sampler, all opinions are of our own.